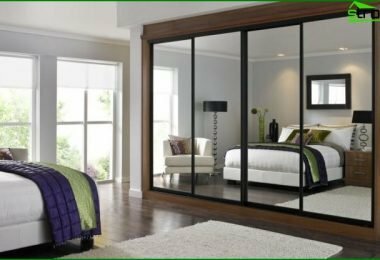 Have you ever wondered why, among other optionsfinishing the ceiling in the bedroom most preferred arrangement of the suspended structure? Most likely, the answer is a functional accessory premises. 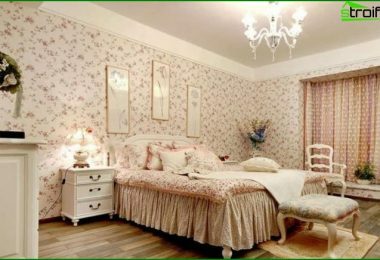 The living room wants to see a festive and elegant, child - friendly and functional, and the bedroom - a cozy and unusual. In the lounge you want to create a pleasant atmosphere of comfort and privacy. The use of false ceiling structures opens up almost unlimited possibilities implementing design ideas of any stylistic direction, while still allowing effectively equip lighting. 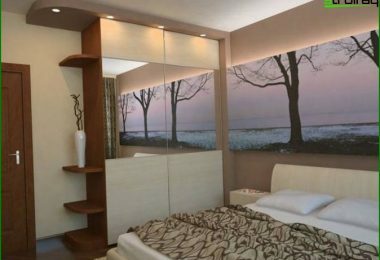 Consider how the suspended ceiling in the bedroom can be decorated - a photo collection of examples of successful arrangement of the ceiling provide the necessary visibility. Structurally, any suspended ceiling consists ofstructural framing and cladding elements. The frame is most often made of galvanized steel profiles and facing material can be drywall, mineralovoloknistye, plastic, fiberglass, wood, metal panels. An embodiment of the suspended ceiling is verymany, they can be a solid (a single plane of the drywall) and modular (panel, rack, cluster, lattice), single and multi-level, effectively combining matt surface and gloss, coupled with latent or spot illumination allows for interesting options in the design . In short, it is possible to realize a variety of design ideas. The ceiling of the bedroom, decorated in a rustic style ( "country") may contain protruding beams or wooden panel. 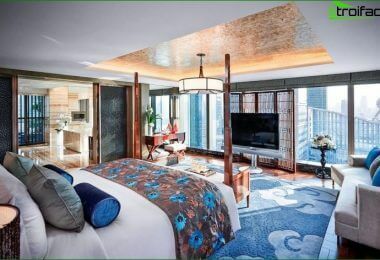 Minimalism style of "high tech", with almost completelack of decorative details, favorably complement the two-three-level design of the ceiling. Focus on the invoice form and detail, in conjunction with proper lighting of the space will give the desired effect. Bet strict geometry shapes, as opposed togenerally recognized accentuation compatibility of color and pattern, is justified, provided a competent selection of surface texture. The ceiling can be decorated with a mirror cloth, as appropriate luster metal fittings fixtures combined with opaque color shades simple form. 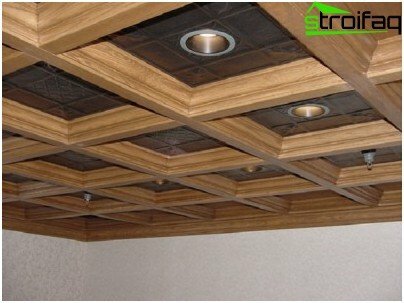 In addition to the beautiful interior design qualitiesceiling makes it easy to hide the irregularities and defects in the base ceiling, thus no longer afraid of a crooked laid concrete floors and persistent cracks in the joints, suspension system will hide all the flaws of builders. The ceiling is easy and convenient recessed luminaire, run the wiring and other communications. Alternative arrangement of lighting in the bedroomwith only one (central) of the upper light source is possible, but it loses much in comparison with the combination of multi-colored spotlights, or with the addition of decorative elements of the ceiling hidden lighting. Construction of additional lighting except for aesthetic effect and bring even functional: the original "Night Light" will set the right mood. Large and spacious sleeping area with highceilings seem uncomfortable. But in this case, restrictions on the arrangement of suspended structures, no! 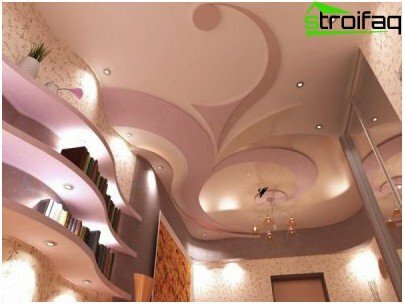 Stacked friezes, central medallions, the asymmetry of the projections or fancy shaped bending structure can achieve a stunning effect in the ceiling decoration. Moreover, by using a multi-level structureceiling can provide the necessary zoning desired brightness (bright lights centered near the dressing table, diffused soft light over the bed, or uniform lighting on the perimeter of the suspended structure). 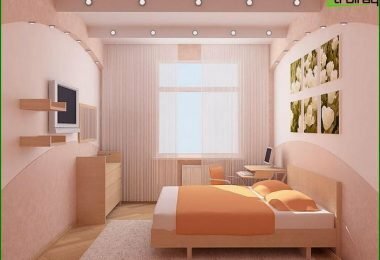 Construction of multi-storey constructions with largedifferences in the level is appropriate in rooms with high ceilings, because after the installation of the ceiling height drops significantly bedrooms. Be sure to take this into account when selecting the design options. 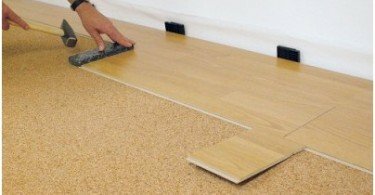 If the initial height of the room is small, try to remedy the situation by using design techniques. 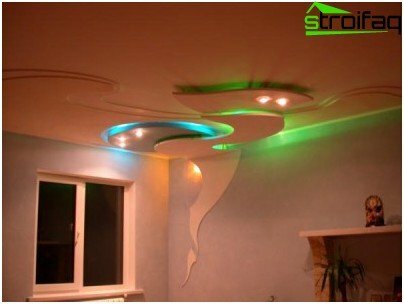 Visually make the room above can be correctselection of color combinations: light blue, pearl, snow white as the main color of the ceiling, combined with bright, contrasting color tone on the walls give the desired effect. Suspended ceiling with mirrored panels and cope with the task. Using a medium-sized moldings (lighter tone than the space inside) will also give the visual effect of distancing the ceiling. Stucco on the ceiling and a massive chandelier also make a ceiling visually below. Choosing a flat chandelier, the ceiling or a plurality of spotlights are preferable. Among other things, important advantage of suspensionconstruction is speed of installation. It eliminates the need for special training ceiling surface (removing old plaster, surface leveling, grinding), which greatly reduces the effort required.